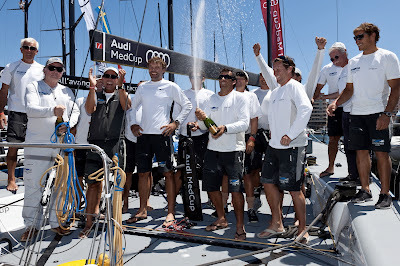 Despite missing out on the last day of racing due to the strong nor'westerly Mistral wind kicking up wild seas on the course area the crew of Container were ecstatic about winning their first Audi MedCup regatta. They are the first German flagged team to win a regatta on the Audi MedCup Circuit, an incredible victory for owner Udo Schuetz, who won the 1993 Admiral’s Cup with a three boat German team. During the eight races sailed in the past week they defeated the world champions and Cascais Trophy winners, Quantum Racing, five times on the run. Yesterday's coastal race victory and first ever win in the class, was crucial in the scheme of things as they emerged 1.5 points ahead of Quantum overall who finished third over the line behind Audi Azzurra. But Quantum Racing weren't crying in their pretzels today having survived a frustrating and tactical regatta where the winds proved extremely difficult to read. Marseille’s wind strengths ranged from 6-26 knots with shifts of 15-30 degrees, extreme variations in pressure and different breezes on either side of the windward-leeward race tracks.